1. Who Really Love's You ? 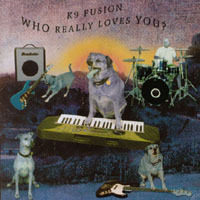 K9 Fusio'n Who Really Love's You ?, is an enhanced cd it unites melancholy yawns and gutteral growls, with spiraling piano flourishes, and bold guitar and bass power chords. Ten year old Sven the mixed-breed love dog plays each and every instrument on his debut album. The only exeption is the drums, wihich are played by Sven's human owner and fellow groove-monster Steve brooks. Every intense vocalization is produced by Sven or one of his canine friends in this interpreted expression of the dogs creative process...It's real it's dangerous. K9 Fusion is a psychedelic dark ride of sound with a raunchy love story and raw panting interludes...Anyone who dared to play their Beatles records backwards will love this music...written and performed by dogs...Face it this dog's the Shih Tzu. This dog music cd includes a song book and a bonus Quick Time video. You can see for yourself as Sven The Love Dog pounds the piano, claw picks his guitar and gnashes his teeth on the bass strings with the ferocity of Hendrix himself ! Don't be fooled by other dog copy cats. These are real dogs playing real music. Dogs and music lovers will be amazed !